The study of traditional Hebraic Qabalah can be loosely divided between two particular schools. The principal of these is called Mahaseh Berashith– the Work of Creation. This is what we might call the “Qabalah proper”- based upon philosophical interpretation of Biblical literature, especially those books dealing with God’s creation of the Universe. (Such as Genesis I.) This is the school that gives us the Tree of Life and the Four Worlds, the practice of Gematria, etc. The second school of Qabalah is termed Mahaseh Merkavah– the Work of the Chariot. This is actually a direct reference to the ancient Jewish shamans known today the “Merkavah Mystics.” These mystics focused heavily upon prophetical and apocalyptic literature- especially the first chapter of Ezekiel, wherein the prophet is granted a vision of the Divine Throne of God. This Throne is actually described in the text as a kind of Chariot (Merkavah), drawn by four mighty Kherubic Angels. Other Jewish legends depict the Chariot as drawn by terrible Seraphim (angelic Serpents of Fire), upon which Yahweh rushes into celestial battle. The Merkavah Mystics believed that man- as the manifest Image of God- had the authority and birth-right to act after the manner of God. This meant that they believed in mankind’s right to create, to perform magick, and to journey into the heavens (like the prophets Enoch and Elijah) in their own personal Chariots of Fire. 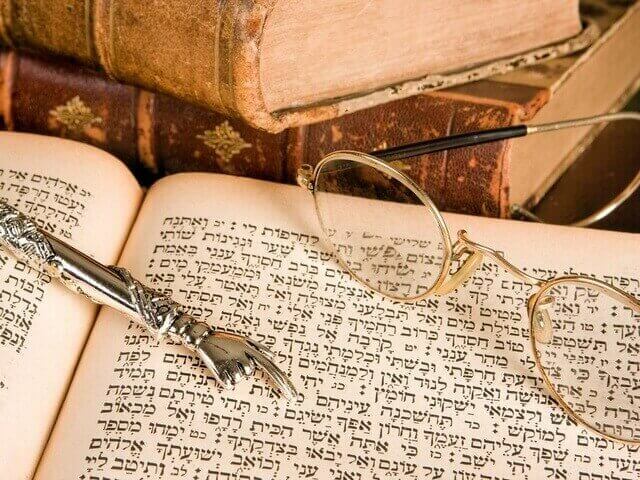 Mahaseh Merkavah could not be practiced without first engaging in deep studies of the Mahaseh Berashith. Yet, this did not always work the other way around. During the Middle Ages, those Rabbis who adhered fundamentally to Jewish law, and studied the Work of Creation themselves, were outspoken against the Work of the Chariot. The Merkavah Mystics were a sub-culture of mages who did not intermingle with “official” Jewish religious authority. Meanwhile, their philosophies and practices were of much interest to their Christian counterparts- the Alchemists, Hermeticists, and especially the occultists who wrote and utilized the medieval grimoires like the Key of Solomon the King. Thus, a large amount of Jewish-based practical magick found its way into Western European occultism, and survives there in several forms today. Aspects of it have been preserved in the grimoires, of course. Other aspects have come to us largely through the Hermetic Order of the Golden Dawn, and you might recognize them as the Pentagram Rituals, the Middle Pillar, the making of talismans, the summoning of Angels and spirits, etc. Over the course of your studies, we shall explore many aspects of both the Mahaseh Berashith and the Mahaseh Merkavah. However, in this particular class, we shall be focusing exclusively upon the Work of Creation. First and foremost, I will explain in detail a vital foundational aspect of the Hermetic Qabalah- the Holy Tree of Life. Afterward, I will cover a related subject of equal importance, the Hebrew Alphabet. This course assumes the student is a beginner with no knowledge what-so-ever on the Tree of Life, the Hebrew Alphabet, or the Qabalah in general. Therefore, the novices among you can use this as your own study material to come to a working knowledge of the Qabalah, and thus read further works on the Qabalah with a solid foundation and fuller comprehension. If you are not a novice, I hope you will find new ideas and viewpoints herein that will further expand your knowledge and experience of the Spheres. This is doubly true, beginner or not, if you will take the information contained here and apply it to your everyday life. The Qabalah focuses heavily upon Archetypal Forces- that is, blueprint concepts behind all physical things and non-physical ideas. Take, for instance, a simple oak tree. Any given single oak tree is only one oak tree out of millions of close and distant relatives. It is AN oak tree, rather than THE oak tree. And yet, when you sat in school and learned what an “oak tree” was, you were not taught about this tree or that tree. You were taught about “oak trees” in general- you were being taught about THE oak tree. This all-encompassing- even hypothetical- oak tree that stands for all oak trees everywhere is an Archetype. Therefore, as you can see, every little mundane object or concept has an Archetype behind it (or- better- over it). Of course, of all the creatures on planet Earth, only humans (so far as we know) have conceived of Archetypal Forces. Like Adam naming all the things and creatures in the Garden of Eden, human beings are uniquely and naturally wired to apply archetypal labels and classifications to all things. The Qabalah, particularly Mahaseh Berashith, could be classified as a direct study of Archetypes and their interaction with the human mind or soul. In order for one’s study to be successful, the student must eventually be able to think in terms of the Qabalah without any specific mental effort to do so. This means that one should look around the mundane world, seeing the invisible Archetypes that lie behind everything. This is what is meant by Biblical literature that insists- Let him who hath eyes, see! “This war is an aspect of Gevurah”, or “That book would classify under Hod” should become second nature to your thinking as you encounter things throughout the day. Peoples moods and mentalities can be classified the same way, helping one to understand both people and their emotions better. The same goes for any idea or concept one encounters, or experiences, or wishes to create. All things comprehended by humans has a classification of some kind- sometimes for good or ill. Doing this with the classifications of the Qabalah is a great way to make good mental associations. Then, further study of the Qabalah (especially the Hermetic variety) will be most fruitful. The method of achieving this end is simple enough. We will begin here in this course, by exploring the glyph of the Tree of Life in some detail. We shall take things one step at a time, allowing foundational ideas to sink in by themselves before moving on to more advanced concepts. Here, the student can concentrate on the structure, content and (most importantly!) the terminology of the Tree of Life. Once that is familiar, further courses in this curriculum will outline the many correspondences between the Tree’s Archetypes, the soul of each human being, and the many “things” that make up the world around us. This glossary is provided to help you during your reading of the course material, and study for the test. There is no need to memorize this material- it is merely for reference purposes. Ain: Nothingness- the highest manifestation of the Divine Source. Ain Soph: Limitlessness- another common term for the highest Divine Source. Ain Soph Aur: Limitless Light- that aspect of the highest Divine Source that can be “viewed” from the physical as Pure White Brilliance. This rests just above Kether, and is nearly synonymous with it. Etz haChaim: The Tree of Life. This is the central philosophical glyph of the Western Qabalah, depicting the fundamental energies and natural cycles that govern creation. LVX: Latin for “Light” and indicating the Light of God. This is generally associated with Solar Light, and is considered the cyclic energy of the Tree of Life and Nature. Qliphoth: “Shells.” The Kingdom of Shells is the demonic realm that exists just below Malkuth on the Tree of Life. Most often, this Kingdom is illustrated as an inverted Tree of Life (or Tree of Death). 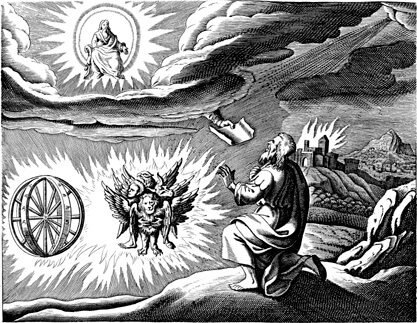 Sephirah (pl- Sephiroth): “Saying.” A Sephirah represents one of the ten instances of “God said…” in Genesis 1. 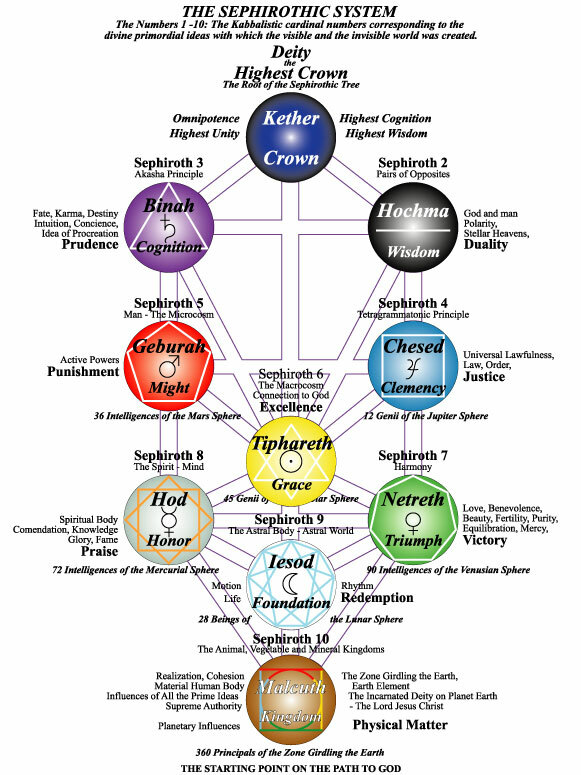 The ten Sephiroth make up the Spheres of manifestation upon the Tree of Life glyph. Shekhinah: “Divine Presence.” The Shekhinah represents the physical aspect of God- the Divine Presence on Earth. Traditionally, the Shekhinah is viewed as a feminine entity, related closely to the Gnostic Mother Goddess named Sophia. She is the Bride of God described in Hermetic texts. The seeds of the Western Renaissance era were sown in the black historical soil known as the Dark Ages. This is to say that the educational and social revolutions enjoyed during the 1400s-1600s CE were created and popularized among intellectuals in the days when the Roman Church still held the world in its grip. They are the reason the Renaissance took place once the Church lost some of that grip. This Tree pattern makes recording, studying, and referencing information incredibly easy. Many related but different classifications can be grouped together under larger classifications. Graphically, this is drawn as many small circles connected to a single circle. These larger classifications can then be grouped together under even higher classifications- so that entire clusters of circles are connected to one or more circles at the very top. More and more refined classifications can be added, making the “tree” branch out as far as necessary. It shows one at a quick glance exactly how different subjects of information all interrelate to one another. 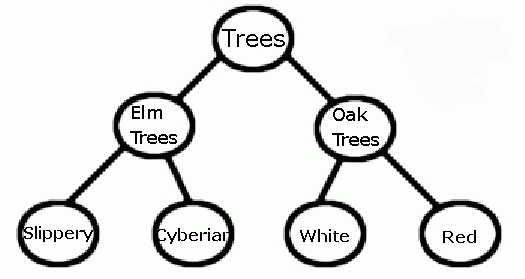 For instance, as in the diagram below, all oak trees could be grouped together in a single circle of classification. That circle can be labeled “oak trees.” However, there are different species of oak trees out there, such as live oak, red oak, white oak, and pin oak. Thus we can add these sub-species of oak as a group of circles beneath “oak trees”- each connected to their common circle. Meanwhile, the oak tree is only one type of tree. 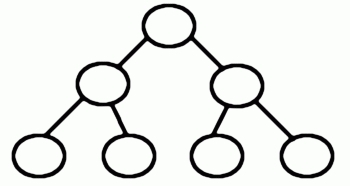 Therefore, it is possible to add higher classifications than “oak trees”- such as just “trees” in our example. Then we can add branches to the diagram for elm trees, willow trees, pine trees, etc, etc. 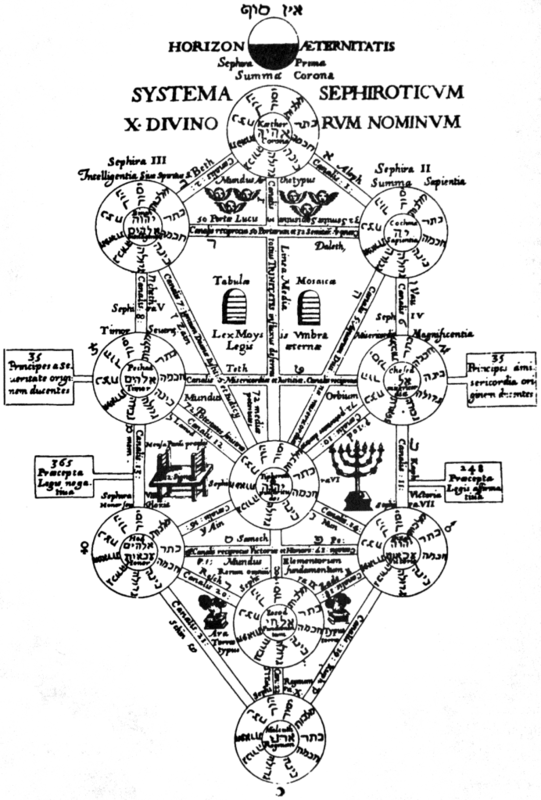 The glyph known as the “Holy Tree of Life” was developed sometime after the 1200s CE (when the Judaic Qabalah as we know it was born). It just so happened that this was during the same period when this new “Tree pattern” method of interfacing with information was in vogue. Thus, if you have ever wondered why the Qabalistic Tree of Life looks nothing like an actual tree, you now know where it really got its name. It is, in fact, a Tree pattern study diagram. The Tree of Life is intended to help you study and meditate upon an infinite number of important Qabalistic and Archetypal principals. More than this, it is intended to illustrate how these Archetypes interact with one another, and how the human soul interacts with them. Long and dedicated study of this glyph- reading many different sources for information and ideas- will help transform your mind into one which thinks Qabalistically. The knowledge and insight programmed into the Tree of Life diagram, all of the Archetypal forces of the universe, are the Divine Fruits of God’s Wisdom. The human soul is there, the mind of God is there, and the Heavenly (or Planetary) realms that stretch between the two are mapped upon it. Some of the earliest representations of the Heavenly Realms in Western civilization were created in the Ancient cities of Babylonia, as the great Ziggurat Temples. These massive “stepped pyramid” structures consisted (in some examples) of seven levels, each one dedicated to a Planetary God, with the Temple of the city’s Patron God perched upon it’s summit. These structures were said to be exact replicas of the Heavens themselves- an idea that continues to this day in Churches and other Holy Places. As the Babylonian Wizard-Priest ascended the steps of the Ziggurat on holy occasions, so too did his soul symbolically ascend the Planetary Spheres toward the Divine. The lowest level of these structures was said to be the Sphere of Saturn, dedicated to Ninib, the God of the Earth, Lord of the Hunt and Harvest- of Life gained through Death and Sacrifice. Next up was the level of Jupiter, dedicated to Marduk, the Ruler and King of the Gods, who was Wisdom, Power, and Abundance. Thirdly was the Martian level, dedicated to Nergal, Lord of the Underworld, War, and Pestilence. Fourth rested the level of the Sun, dedicated to Shamash, the Sun God, the Judge of the World. Upon this rested the level of Venus, dedicated to Inanna Herself, the Goddess of the people, Lady of the Womb, Reproduction, Passion. Then followed the level of Mercury, and of Marduk’s son Nabu, lord of Writing, Art, and Wisdom. And, finally, was found the level of the Moon, dedicated to the Father of the Gods Nanna, Lord of the Waxing and Waning Tides of Nature. Once these seven heavenly spheres were ascended, the Wizard-Priest would reach his destination at the Temple, House of the Divine. 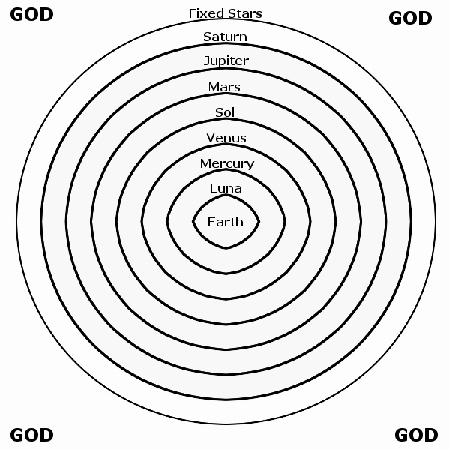 The orbital circles of these Planets became the famed Seven Hebrew Heavens or Palaces. What is perhaps the first recorded description of these Heavens (most likely written right there in Babylon) is the Ethiopian Book of Enoch (or 1Enoch). In this legend, we see the Patriarch Enoch- “who walked with God”- whisked away by Angels to the Heavenly Palaces and given a tour of the Cosmic realm- ending with an audience at the Throne of God Himself. This book was one of the most popular writings among the Merkavah Mystics who made a practice of Astral Traveling through the heavens on a journey toward God. There are many versions of these Heavens. Perhaps the first is the basic concept of each one being stacked upon the other, just as with the Ziggurats. 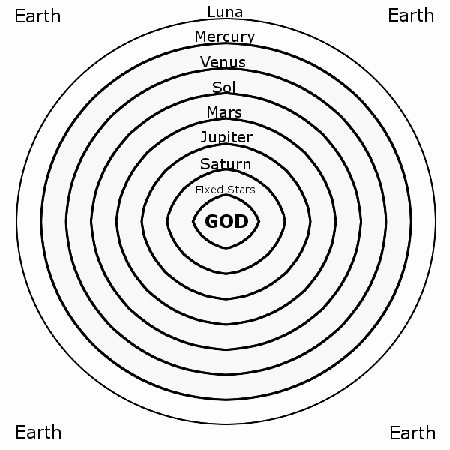 Following this would be the concept of a group of Concentric Circles (based upon the Planetary orbital paths). This latter model places the Divine Plane as the outermost circle (encompassing all of creation), showing an upward Ascension from Earth toward the highest Divine realm. This “outward radiation from the Divine” has a name in the Qabalah. It is called “Emanation.” This is simply the process by which the Divine- usually seen as being “out there” somewhere, or “down deep” within us- reaches out from Its own realm to manifest onto ours. The various Heavenly Spheres are these different stages of emanation. In modern terms, we could think of emanation taking place through various physical dimensions. We might start with the quantum realm, which leads to the atomic realm, which leads to the molecular realm, which leads to the realm of matter. Another point of view is by way of geometry: begin with a point, which has no mathematical dimension. The point, then, leads to the first dimension- the line. Beyond the line we come to the second dimension- the plane, which finally leads to the third dimension of geometric shapes (cubes, spheres, etc.). Lahmu and Lahamu emerged, Their Names pronounced. Anshar and Kishar were born, surpassing them. They passed the days at length, They added to the years. And Anu begot Nudimmud in His likeness. He had no rival among the Gods His peers. Conversely, some cultures- such as the ancient Christian-mystics known as the Gnostics- viewed Divine Emanation as a process of increased imperfection. For instance, think of a cassette tape or photocopy. The original is perfect. Then a copy is made which is slightly imperfect. From that copy another is made, and so on and so forth, until the end result is a horrible excuse for the original- not even recognizable. This is why the Gnostics viewed the physical realm (the end result of Divine Emanation) as corrupted and even evil- something from which to escape. However, the Merkavah Mystics had other ideas. They believed in the immutability of the Divine. That is: the Divine could not be divided, lessened, or made imperfect in any way. Therefore, each new emanation of the Divine must actually contain the whole of Divinity within it- so that no Heaven was lesser than another. For example, imagine viewing a faceted gem very closely, so the face of only one facet is visible at a time. The entire gem is always there, though most of it is hidden. Another view is that the emanation of the Heavens is similar to flames spreading outward among a sea of candles. Each flame is lit by the one before it- and no single flame is lessened or increased by those before or after it. Thus, the Merkavah Mystics’ ascension through the Heavenly Palaces became a descent into the Heart of Creation, rather than an escape from the physical realm.